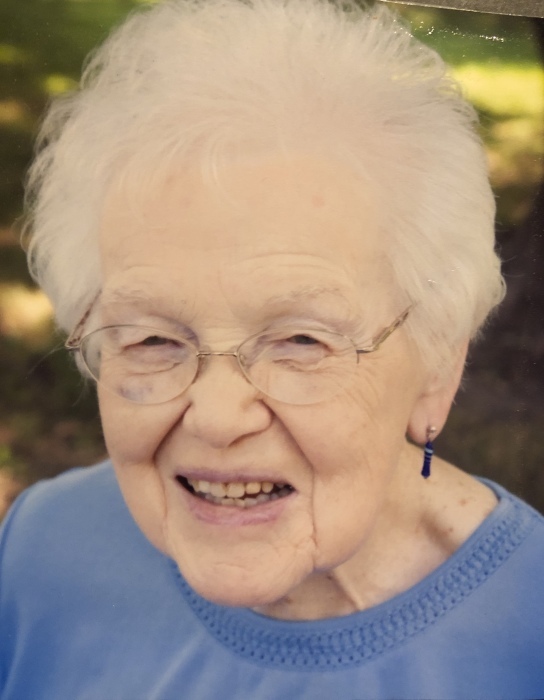 Esther Pearl (Nicoll) Glenn, formerly of Olin, passed away on Monday, January 28, 2019 at Southfield Care Center in Webster City, Iowa. Services will be held on Saturday, February 2 at the Olin Community United Methodist Church. Visitation will be held from 10:00 to 12:00, with the funeral to follow at 12:00. Lunch will be provided after the service. Burial will be private. Donations may be made to the Olin Community United Methodist Church or its Women’s Group, or to the charity of your choice. Esther was born on October 17, 1923 in Mechanicsville, Iowa to Lester and Hattie Nicoll. She graduated from Mechanicsville High School, earned her bachelor’s degree from Iowa State University, and took advanced courses at the University of Iowa in early childhood education. On June 12, 1949 she married James Calvin Glenn, and they moved to a farm near Olin. Although she started her career as a home economics teacher in Monticello, she later switched to teaching first grade and helped several generations of Olin children learn to read. Esther was a devoted member of the Olin United Methodist Church and its Women’s Group. She and Calvin were members of the Anamosa Camera Club, and she served as a 4-H leader, a Sunday School teacher, and a Library Board member. She enjoyed spending time with her family, cheering on the grandchildren at their events, hosting holiday dinners, playing cards and dominoes with friends, and traveling. She sewed beautiful quilts for her grandchildren. She will be missed dearly and remembered for her generosity and her love of education. Esther is survived by her daughters, Karen Fowler and husband Rick of Webster City, and Vicki Glenn of Somerville, Massachusetts; grandchildren Maile Rees and husband Tim of Fort Dodge, Keilani Fowler of Kansas City, Eric Glenn and wife Cari of Lexington, Kentucky, Sarah Glenn of Chicago, Adam Glenn and wife Kimber of Plano, Texas, and Joshua Glenn-Kayden of Somerville, Massachusetts; and twelve great-grandchildren. She was preceded in death by her husband, Calvin Glenn; her son, Paul Glenn; her parents, Lester and Hattie Nicoll; her parents-in-law, Victor and Rose Glenn; her sisters, Jean Picht and Eleanor Starr; and her brother, Howard Nicoll.